It’s an old story. Men do things. Women want to do things. Men make it seem too difficult. Women prove them wrong. Here’s the headline. 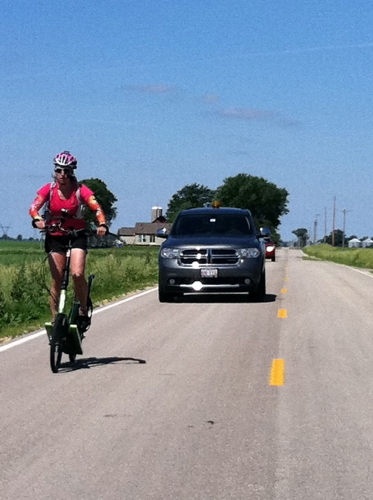 Jenny Hadfield, author, writer, and extreme athlete destroyed the current 111 mile record today by riding 152 miles in 15 hours on the Grand Illinois Trail and Parks (GITAP) bike tour Century course. Not content to simply complete the demanding course, Jenny decided to ride the first half of the course a second time. It was an extraordinary effort, and as Jenny would be quick to tell you, it was a team effort. It was a team that Jenny put together, that supported her, and in th e end got to experience something that few ever get to experience. Jenny, along with her team, did something that no other woman had ever done. Like Amelia Earhart, Jenny Hadfield has made a statement for herself and, by extension, for all women. It was also the second time that Jenny had set the record. 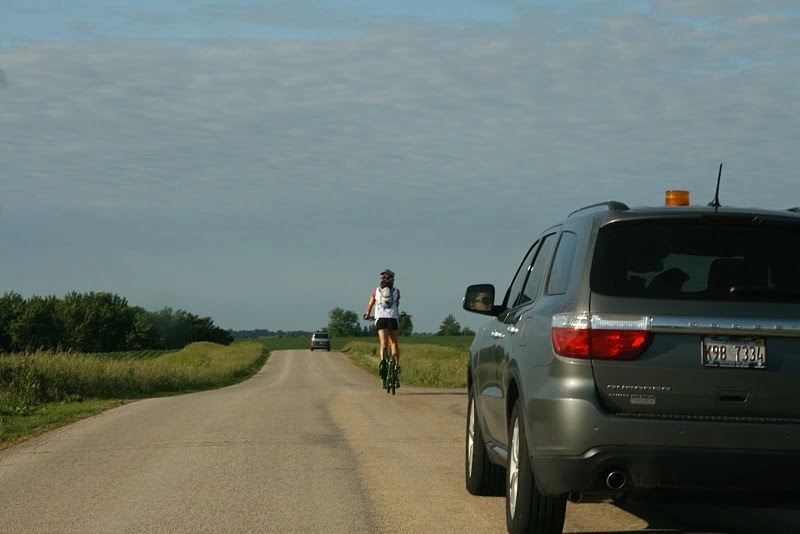 Last September as a part of her 500 mile ride from Chicago to Toronto she rode 141 miles in a single day. But, it wasn’t considered “official” because it wasn’t part of a cycling event on a prescribed and measured course. This time it was. This time it was a squeaky clean effort. Signed, sealed, and delivered. My part? I was the “crew chief”. What does that mean? I helped prepare the ElliptiGOs for the ride. [Yes, I’m a motor sports guy. We had the primary ride AND a back-up, fully prepared second ElliptiGO] I prepped the lead vehicle and the chase vehicle. I studied the course, prepared the maps, plotted the route on the GPS’s, and drove the lead vehicle. Deb Dean drove the chase vehicle, prepared all the food for Jenny and the team and set up all the aid stations. Kathy O’Malley and her grandson Tris Bucaro drove the media car and were the official photographers and videographers. And, Harry and Karly Spell provided on-course support and – yes – aerial support. Harry took Tris up in an airplane to get overhead shots. But the day belonged to Jenny. She was prepared. She was serious. And she was successful. Somewhere around mile 90 I looked in the mirror and saw her body position change subtly. She leaned into the bars a bit more. Her face was a little more set. She knew then that she would complete the Century ride. She knew then that she would break the 111 mile record. The only question was whether she wanted to beat the record or shatter it. She shattered it. We pulled in to get verification of the Century and then Jenny looked at her crew and said: “Let’s just do it again”. We piled into the cars and headed out. It was like Deja Vu all over again. We were out on the course one more time. 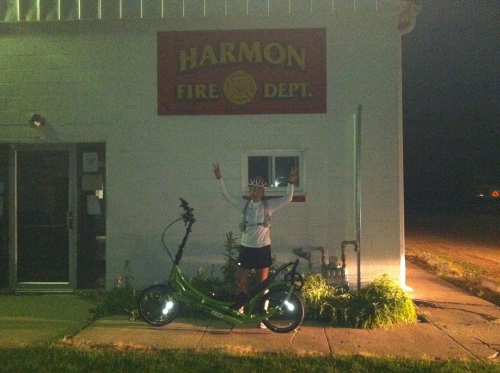 In the end, over 152 miles and 15 hours after we started, at the Fire Department of Harmon, Illinois, it was over. There was no crowd. There were no photographers. Just Deb Dean, Jenny, and me. She’d done it. She’d done what no other woman had ever done. That’s often the way it is. Most of our successes are private moments. And that’s fine. At the end of the day, wherever that is, it’s what we are to ourselves that matters most. Way to Jenny! Love the determination part once the shattered goal was in sight! Way to go crew! The team got it done together!